A month or three ago, I convinced Elizabeth to sign up for a 5 mile race. 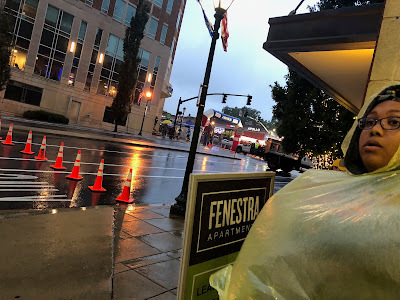 She's not really a runner (except when I make her), but she gamely agreed to give it a shot when I promised her the Rockville Twilighter 8K would be a festive night race with free beer. And by God, I delivered a night race with free beer. What I did not deliver was just about anything else that might make a race pleasant. Guys, it friggin' POURED all day. I'm talking torrential rains. I was getting emergency emails with flood warnings for portions of the county. But there was no lightning, and thus the show went on! And my dear brave Elizabeth showed up all the same. When the 8:15pm race time rolled around, absolutely nothing had changed: it was still raining absolute buckets. But the wind wasn't too terrible and hey, as I noted early this year, there's no level of wet beyond soaked, so we lined up. After a quick rendition of the national anthem by a very talented 14 year old, we were off! The course left the shopping complex almost immediately, veering off into local neighborhoods. A few brave souls hunkered on their front porches and cheered us on, but for the most part it was quiet. There were a few more hills than I might otherwise have expected but nothing that slowed me down overmuch. After completing that loop, we briefly retraced our steps figure-eight style before setting out for a loop in the opposite direction. This part was flatter, and featured a circuitous tour of the Montgomery College parking lot. There was brief overlap between those entering and exiting the parking lot (think entering/exiting WWoS during the WDW Marathon) and I looked for Liz but didn't spot her before the course peeled off. Shortly after that we popped onto a road - possibly Rockville Pike but I don't think so? Anyway, we ran down said road before veering back into Rockville Town Center to finish exactly where we started. And how was my race experience? Not bad, all things considered. I met my A goal - I brought it in under 45 minutes, what what! - and my supplementary goal, which was not to fall and snap any limbs, so that was a success. 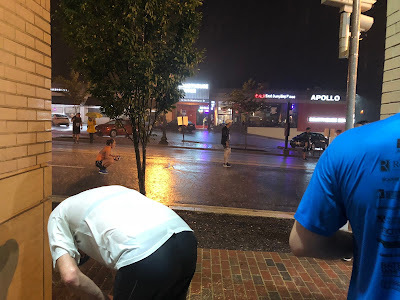 I did run into the same problem I had during the equally rainy 2014 Wine & Dine Half Marathon, where the reflection of the lights on the puddles and wet pavement sometimes made it hard to tell where, exactly, the ground is. But I made it! The post-race party was supposed to feature music and beer and food. 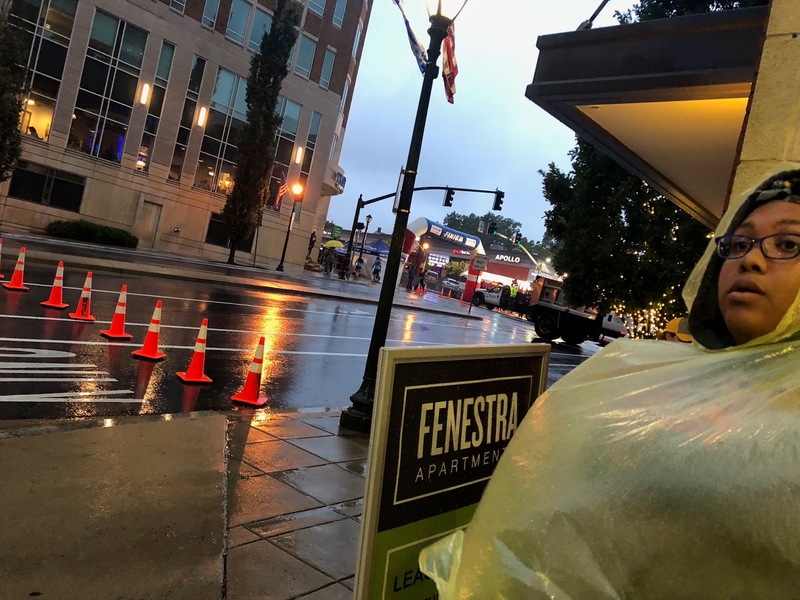 Maybe it did, but finishers were mostly just congregating under the eaves of the closest building. 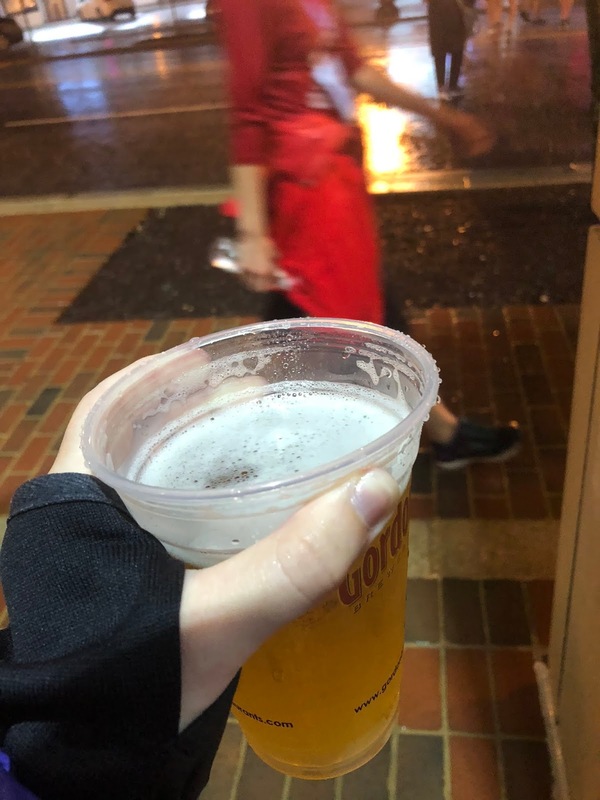 While I waiting for Elizabeth to finish I hightailed it over to the complimentary-for-runners Gordon Biersch beer tent and grabbed the first thing they had available before running back to the covered sidewalk. I'm 100% sure there was rain water in my beer by the end but it was pretty good! I think maybe a white ale or something? Finally I saw Elizabeth running in, gallantly escorted by a Storm Trooper, obviously. She has promised to write her own recap of her experience so keep an eye out. I gave Liz the other half of my beer and then we drove home, because OH MY GOD IT WAS RAINING SO HARD YIKES. Based on the higher bib numbers I saw vs. number of results, I'm pretty sure there was something like a 50% attrition rate. But hey, we showed up and showed out! Go us!